Looks beautiful; the style was exactly what I wanted. I wish the gold color was toned down a bit, but lighting is soft and elegant. Harrison Lane has been a top manufacturer of home décor products for over 30 years. Harrison Lane is committed to providing each customer with the highest standard of customer service. For customer service inquiries or to initiate a return, please contact Harrison Lane at servicedesk2000@gmail.com or 800-524-1539. This beautiful chandelier features a 4-light design and is decorated and draped with crystals that capture and reflect the light of the bulbs. The frame is wrought iron, adding the finishing touch to a wonderful fixture. 4 Lights , Height 14" X Width 15" Chandelier comes with both hardwire and plug in options so you have a choice which to use ! Assembly required .Professional installation is recommended. Requires (4) 25 watt candelabra bulbs. Comes with 24" of chain/wire for hardwire and 12 feet for plug in ! Shades included ! Dimensions 14.0 In. X 14.0 In. X 15.0 In. We thu k it will work well in my bedroom as we are redorating. "Does this item come fully assembled?" yes, I just had to have it hardwired and I put in the 4 candelabra bulbs! yea! 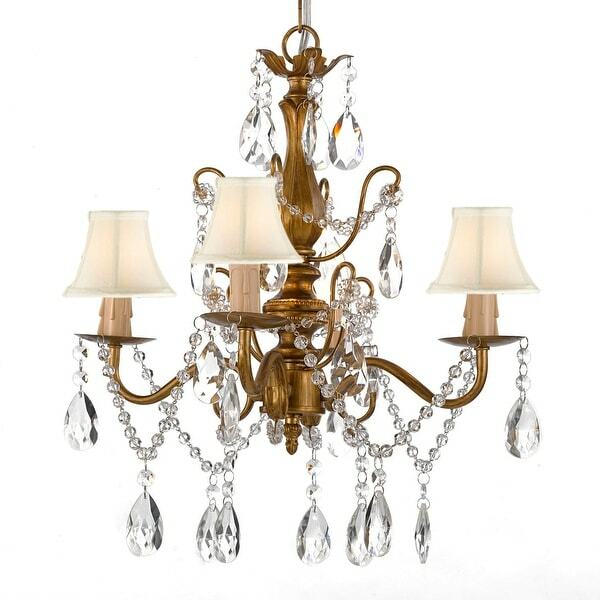 Venetian Italian Style 5 Light Chrome Finish and Golden Teak Crystal Chandelier Large 25" x 28"